I had a fantastic night out when I saw Charles Lloyd and the Marvels at the Lincoln Theatre on Saturday, February 6th with friends. The show was ninety minutes of folk-inspired jazz, a feeling that was influenced by the pastoral tones of guitarist Bill Frisell but was, in the end, a unified, easy emotion emanating from the entire quartet. While Frisell and saxophonist/flutist Lloyd are both modern jazz giants in their own right, the rhythm section of bassist Reuben Rogers and drummer Eric Harland were not overshadowed but instead equal contributors. The setlist included selections from the band’s wonderful new album on Blue Note, I Long to See You, along with well-chosen standards of various backgrounds. While beautiful in recorded form, the live version of traditional folk song “Shenandoah” was even more picturesque in the live setting, as Lloyd’s angelic runs helped the tune transcend its simple roots. “Sombrero Sam,” one of Lloyd’s signature songs, was given a sparsely funky treatment, with Frisell helping lay an intricate foundation for Lloyd’s breezy flute. The band’s humorous, joyful approach enabled the audience to connect with the music on a deeply human level, as Lloyd would dance and play the maracas at times, and Rogers’ and Harland’s solos playfully teased the audience. The sold out theater gave the band a standing ovation both before and after a tender two song encore, and this empathetic unit of jazz masters earned every bit of adulation. Thursday, February 11th (7:30 – 9pm): “A NOW Shade of Blue” at Huntington Recital Hall, Capital University (Bexley). Capital’s NOW Music Festival, marking its “30th consecutive year celebrating contemporary music,” is a five day festival of workshops and concerts featuring music by modern composers in multiple genres. Thursday’s concert examines modern jazz composition, with performances by Spectrum, Capital’s faculty jazz ensemble, with special guests Shane Willis and Steven Jacobs, and the Capital University Big Band under the direction of Dr. Lou Fischer. Spectrum will play material by faculty composer (and the band’s guitarist) Stan Smith, and the Big Band will play works and arrangements by faculty including Fischer, Michael Cox, and the late Mark Flugge’s big band arrangement of his tune “Drivin’ the Bus.” As with all of the NOW events, this show is FREE and open to the public. 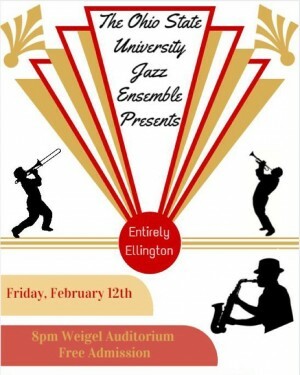 Friday, February 12th (8 – 10pm): OSU Jazz Ensemble: “Entirely Ellington” at Weigel Auditorium. Under the direction of Kris Keith, the top OSU jazz band will pay homage to the great Edward Kennedy “Duke” Ellington, presenting a program “to inspire continuing interest in Ellington’s unique ensemble.” The band will be joined by special guest Caroline Hartig, professor of clarinet, as it plays selections including: “Take The ‘A’ Train,” Billy Strayhorn, trans./arr. Vaughn Wiester; “The Tattooed Bride,” Ellington; “Pyramid,” Ellington and Tizol; “Star-Crossed Lovers,” Strayhorn; “Rain Check,” Strayhorn/arr. Clayton. Also featured are Ellington’s and Strayhorn’s arrangements inspired by The Far East Suite and Edvard Grieg’s Peer Gynt Suites. This show is also FREE and open to the public. The program will explore the exciting possibilities in creating two piano jazz versions in the tradition of other great duo piano performances by Herbie Hancock and Chick Corea as well as Hank Jones and Tommy Flanagan. Among the selections to be performed will be Herbie Hancock’s “Maiden Voyage,” Charlie Parker’s “Confirmation,” George Gershwin’s “Liza,” Morey and Churchill’s “Someday My Prince will Come,” Thelonious Monk’s “Well You Needn’t,” and Harold Arlen’s “Paper Moon,” as well as many others. Of course, this show is also FREE and open to the public. Have a great week! Along with the above lineup of concerts at our local universities, don’t forget about your jazzy options for Valentine’s Day!